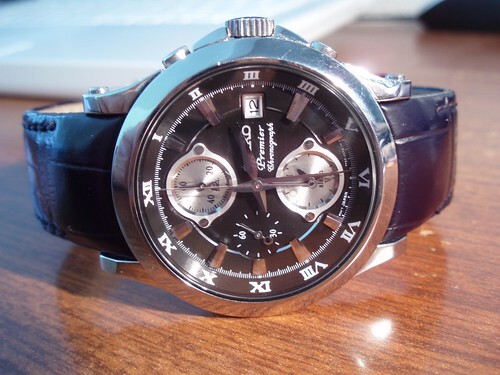 This handsome men’s watch has a sophisticated look and classic styling. Crafted from titanium, this watch is lightweight, extremely durable, nickel-free, and hypoallergenic. 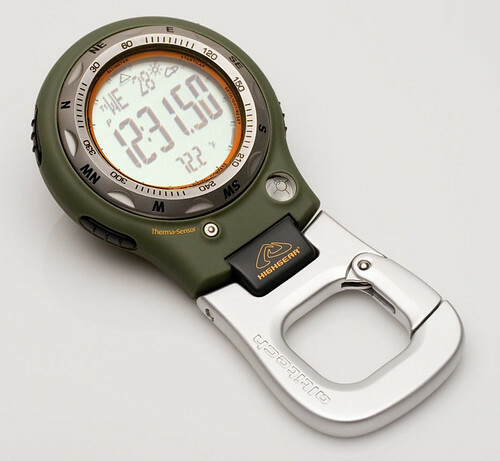 It features a gray dial and three-hand function with gold-toned hands and bar markers. The Lumibrite hands and markers make this watch easy to read, day and night. It also has a day/date window at the three o’clock position. The dial is set in a bezel of gold-toned titanium and features a gold-toned crown. 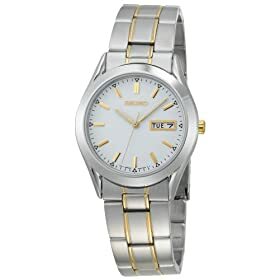 This watch presents on a bracelet-style titanium band accented with gold-toned titanium links. It fastens with a double-locking clasp. 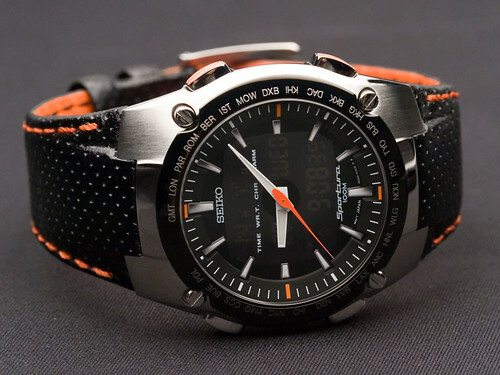 Other features include a scratch-resistant Hardlex crystal and a screw-down caseback. 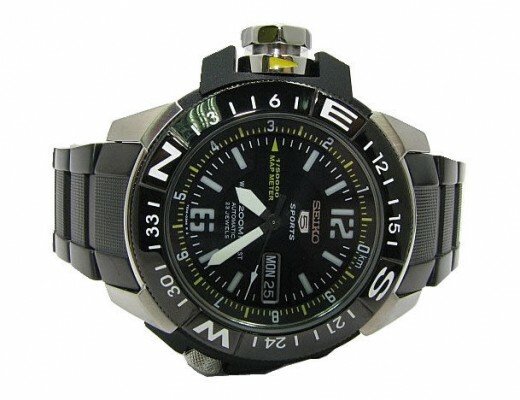 Water tested to 50 meters, this watch is suitable for showering or swimming in shallow water. 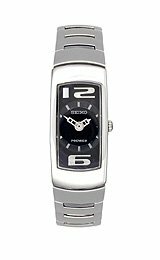 It features Japan quartz movement and has a battery life of five years. 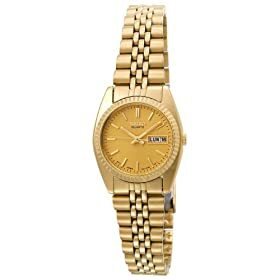 This attractive ladies watch is crafted from gold-toned stainless steel and features a gold dial set in a fluted gold-toned bezel. Other features include three-hand function with luminous hands and markers and an English/Spanish day-date window at the three o’clock position. The gold-toned bracelet-style band is crafted from links of stainless steel and fastens with a fold over clasp. 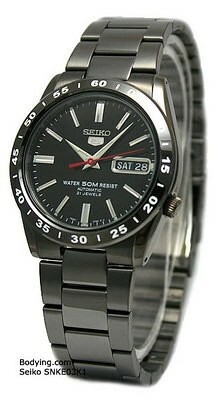 This watch features Japan quartz movement and is water resistant to 30 meters. A twist of modernity with a touch of style. 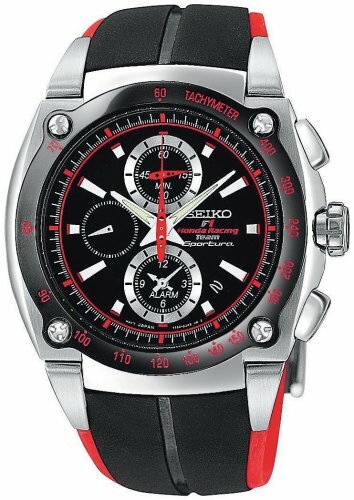 This Seiko timepiece will collectively match any suit for a night out in town. A classic! 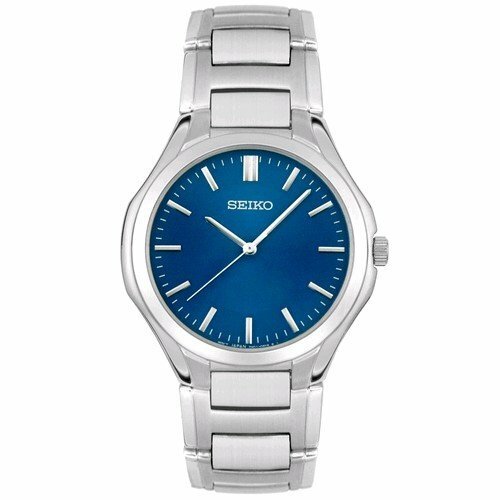 This stylish watch by Seiko features a clean and simple timepiece. This is a perfect timepiece for everyday wear. 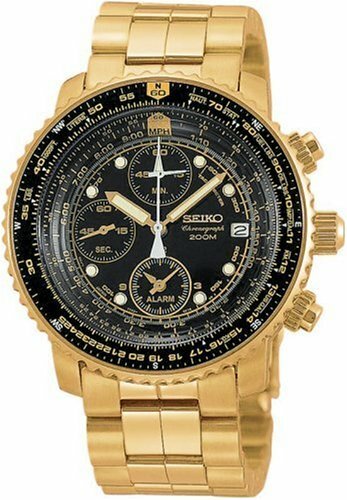 This black and gold flight chronograph watch has handsome styling and a stunning array of features. It has a round black dial, with luminous markers and large luminous hands, set in a gold-toned stainless steel bezel with coin-edge detail. 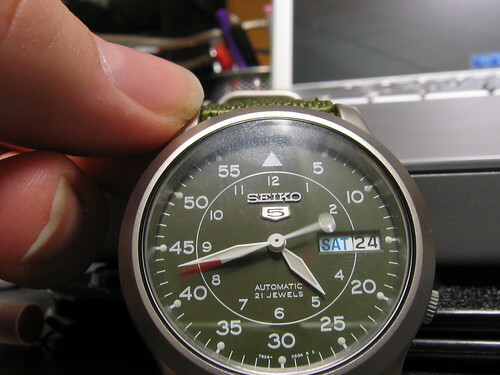 The watch features a date window at the three o’clock position and three sub-dials. 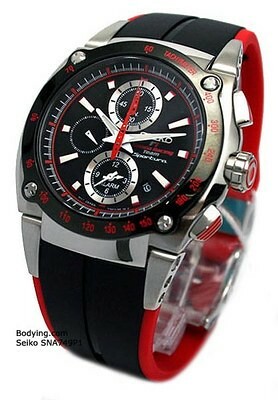 The chronograph offers precise stopwatch timing, measuring up to 60 minutes in 1/5-second increments. The alarm sub-dial has two small hands and can be set on a 12-hour basis. It doubles as an international travel clock since the alarm hands can be set to indicate the time in a different time zone. 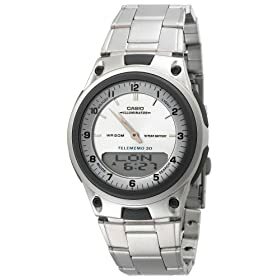 This watch also has a bi-directional rotating slide rule bezel for performing many types of calculations. 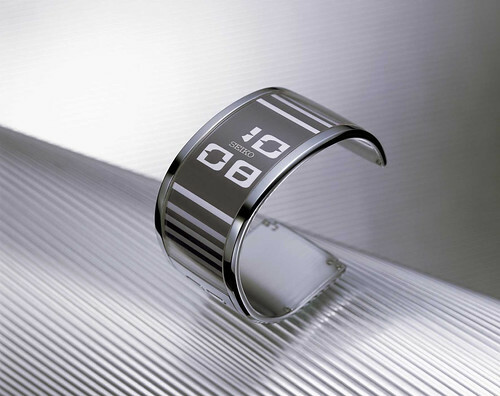 Other features include a scratch-resistant curved Hardlex crystal and a screw-down crown and caseback. 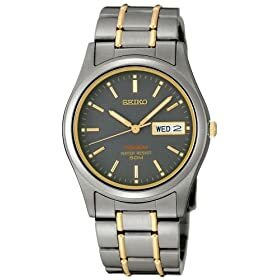 The watch is presented on a gold-toned stainless steel link bracelet that fastens with a fold-over-push-button-clasp-with-safety. 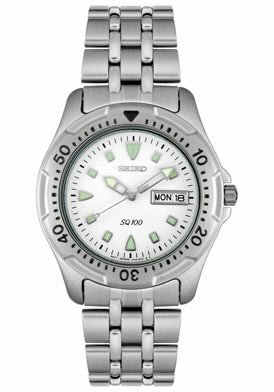 Water-tested to 200 meters, the watch is suitable for skin diving. It has a battery life of two to three years. 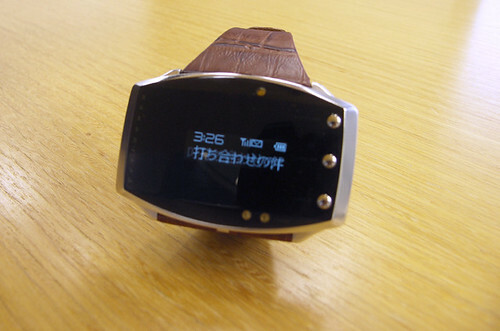 Seiko Japan revealed an improbably big watch prototype that hooks up with your cellphone via Bluetooth. The huge display shows you that little envelope indicating that you’ve received a new message, and then can also reveal who sent it and the message subject. Continuously communicating with your cellphone, the device can either make a noise or vibrate your wrist when a call comes in. 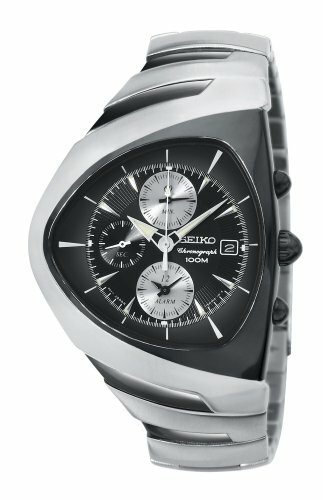 Seiko says it will start shipping a watch like this “by 2007” but didn’t reveal how much it would cost. This is the new watch that my mother bought me for Christmas. 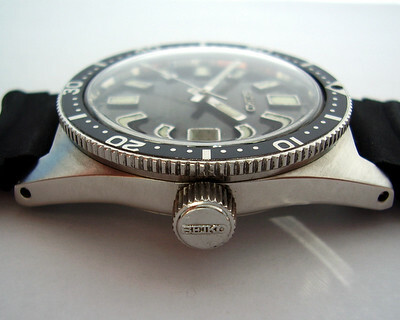 A Seiko Sportura (model SNJ007). It supports multiple times zones, and the LCD can show the same or a different time zone from the analog dial.